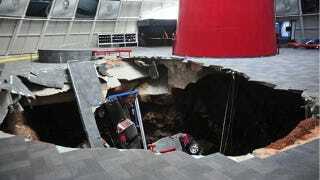 Eight vehicles, including two Corvette ZR1s, were swallowed by a sinkhole opening up under the National Corvette Museum in Bowling Green, Kentucky this morning. Local WKBO News reports that the sinkhole is 40 feet wide and 20-30 feet deep. There's currently no information if the sinkhole is growing or not, but here's the one shot we have of the sinkhole itself, right under the Skydome floor. No one has been hurt so far, the fire department is on site, and a structural engineer will be advising the museum what to do now. Update 9:56 a.m.: WKYU-FM has released a list of cars swallowed up in the sinkhole. Two are on loan from GM and six are owned by the museum. Update 10:08 a.m. The local Daily News reports that the sinkhole opened up under the Skydome of the building. The dome is now closed, but the rest of the museum remains open. Museum Executive Director Wendell Strode told the newspaper that this is the first incident of a sinkhole in their history. He said structural engineers from Western Kentucky University were on their way to assess the situation. If you're wondering why a sinkhole might open up under the Corvette Museum, it's in the middle of the state's largest karst region, the AP reports. Karst means lots of underground caves (the museum is half an hour from Mammoth Cave National Park, the largest complex of caves in the world), and it means sinkholes. Update 10:22 am. Emergency personnel allowed the museum staff to move the collection's 1983 Corvette out of the Skydome room, the Courier Journal reports. There weren't supposed to be any Corvettes for the 1983 year, so the one prototype in the Corvette Museum is the only one in existence. According to the museum's communication manager, the nearby Corvette plant is fine and has no sinkholes of its own, the Courier Journal reports. Update 10:54 am. Some 25 cars remain in the Skydome and structural engineers are trying to determine the best way to get them out, WDRB News reports. Update 11:10 am. The Corvette Museum is now closed for the day, according to a statement from the museum itself. The museum went on to explain the nature of the collapse, first alerted to them by motion sensors. Update 11:30 am. This picture from Justin Hyde gives a sense of the width of the sinkhole within the Skydome room. Updated 12:25 am. Museum staff are moving the most at-risk cars out of the Skydome to safety. See pictures of the action right here. Update 4:16 pm. The museum releases security camera video of the sinkhole opening up and swallowing the first two cars. Watch it right here.